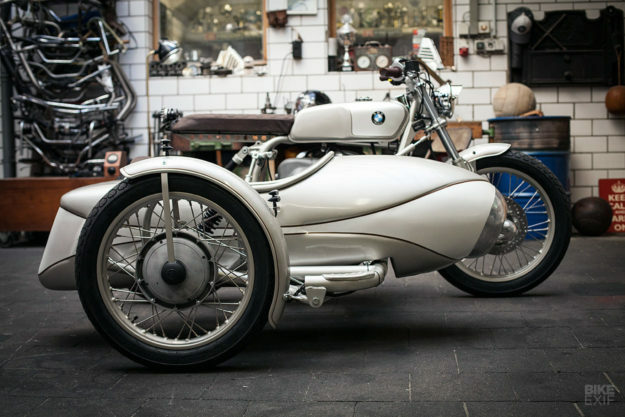 Kingston’s classic BMWs are elegant customs that take our breath away, time after time. But there’s something we haven’t seen Dirk Oehlerking do yet; serve up one of his signature airheads with a little something on the side. 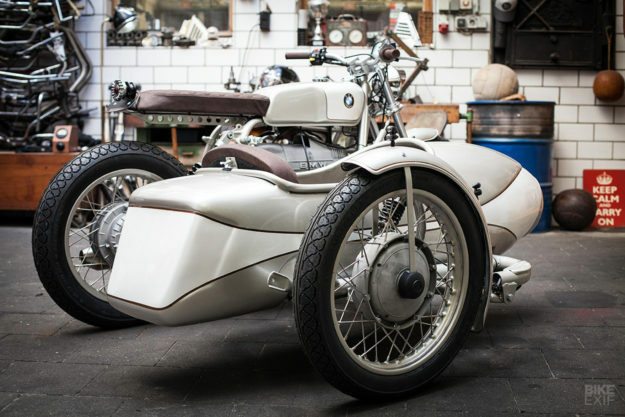 This showstopping R80 from the Gelsenkirchen workshop is the sidecar rig we didn’t know we wanted, until now. 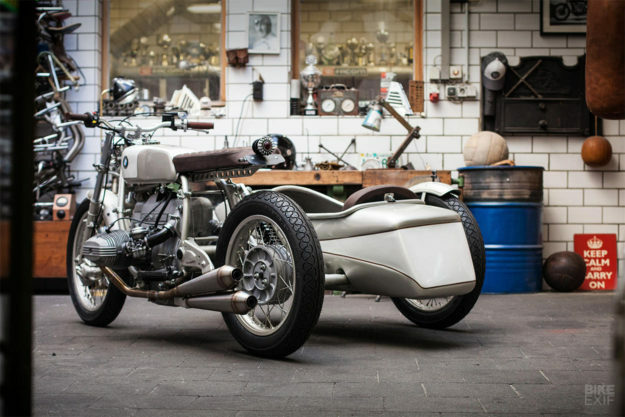 It’s not just another cool Kingston boxer—there’s just as much style in the sidecar itself. Dirk is based in western Germany, but this commission came from Austria. 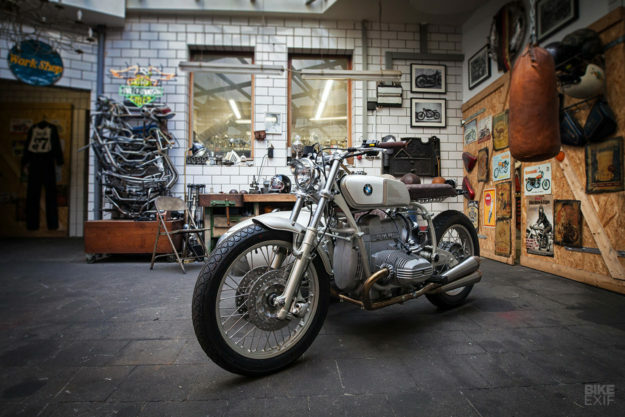 The owner of the Iron Heart store in Vienna, a ten-hour drive from Dirk’s home, already has a BMW café racer from Kingston—and he now wanted a BMW sidecar in his garage. 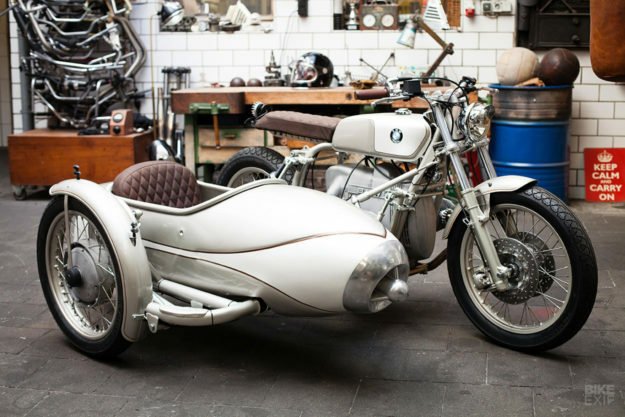 Dirk managed to source a BMW R80/7 that already had a Ural sidecar attached. It seemed like the perfect platform to start with—but in the end, most of it ended up in the bin. Since Dirk’s built several of his signature Beemers, he’s about to start selling the seat, subframe and fuel tank you see here. The subframe bolts right on to the R80 with zero drilling or welding. It can accommodate any of the seat styles Dirk will be offering, but here he’s stuck to a slim bench seat. The new fuel tank is modeled on the mystery classic Yamaha tank that Dirk normally favors for these builds. And the finned taillight (made with a BMW exhaust flange) is another Kingston catalog part. Dirk overhauled the /7 motor and transmission, before popping them into the RT frame. 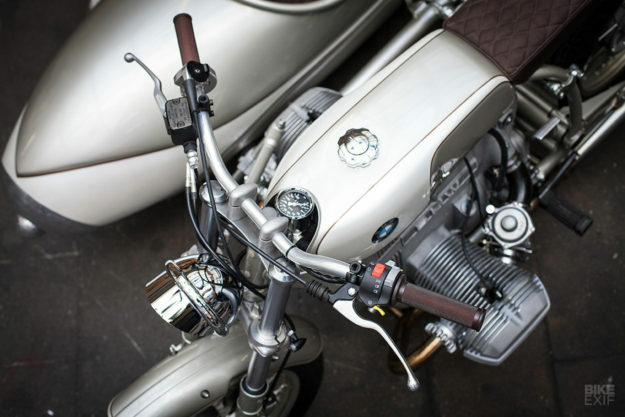 The BMW still uses its original Bing carbs and air box. The exhaust is from specialists Hattech; it’s a stainless steel system, built to Dirk’s design. 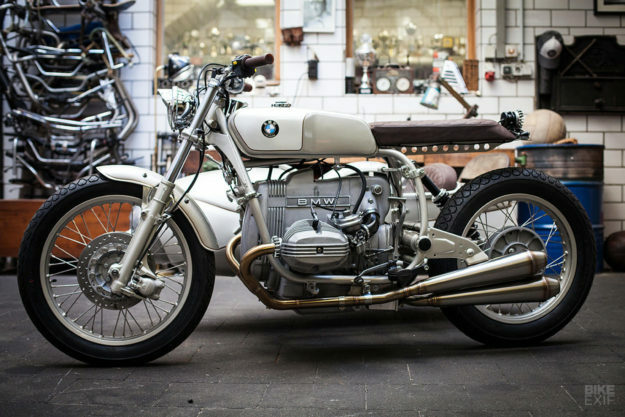 He also swapped out the final drive and rear wheel for those from a R80G/S, leaving him with an 18” spoked rear wheel and shorter gear ratios for more abrupt acceleration. And he’s replaced the rear shock with a YSS unit at the OEM length. Up front are the wheel and twin disc brakes from a R100 RS. To help the stance, the forks have been shortened a little, and the original front fender trimmed down. 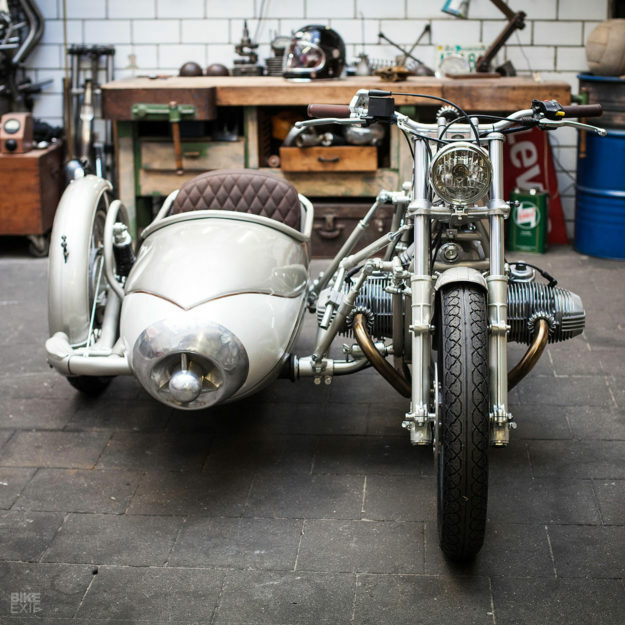 Dirk massaged and rebuilt the sidecar body using aluminum, until he was one hundred percent happy with its lines. He even built an original ‘torpedo wing’ nose cone into the front of it. Inside is fresh upholstery, done in a brown quilted pattern to match the pilot’s seat. 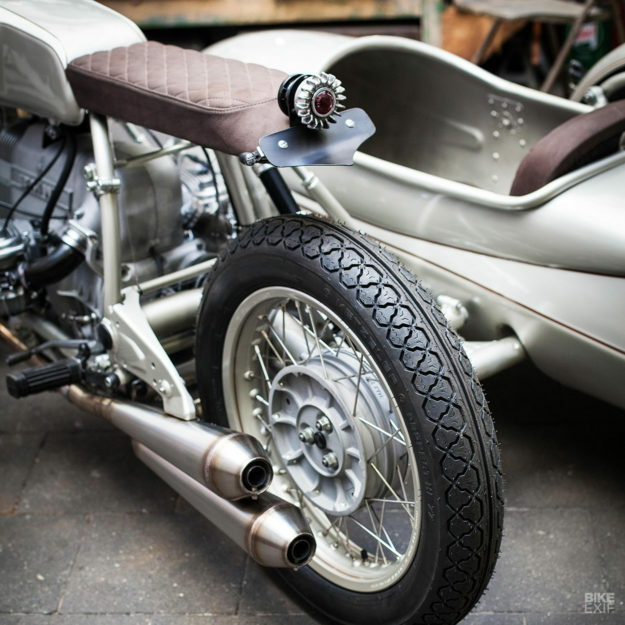 The sidecar’s fender is from a R100RS, and the shock is a custom-built unit from YSS. Best of all, the rig is attached to the bike with removable brackets, so that the owner can switch it to solo mode in no time. Dirk’s seen to the little details too. In the cockpit, you’ll find a set of low-rise bars, a new throttle and grips, basic switches and a small, tucked away speedo. The tires are a mix of classic Metzler ME33 and ME77 treads. But it’s the paint scheme that really seals the deal. It’s a mix of champagne silver metallic and mother of pearl, separated by gold pin striping. 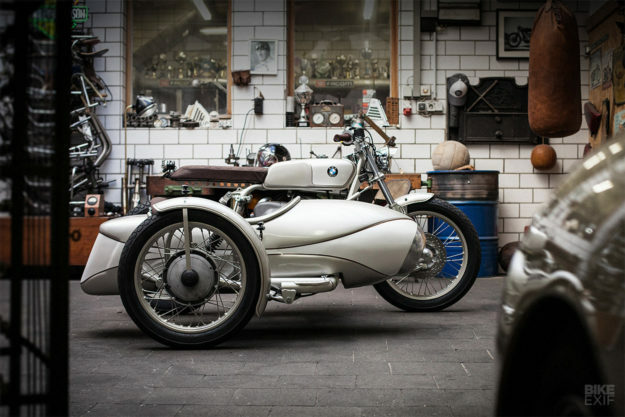 And that palette extends to the frame and sidecar too. Building a sidecar rig is a mammoth task on its own. But building one as gorgeous and cohesive as this? That takes real talent.